Simply put if the country increases its Factors of Production it will be able to prooduce more goods and services. In Brazil the oil discoveries of the last decade meant economic growth (and therefore development). Policies that improve the ability of Factors of Production to produce more (ie increasing productivity) will allow the country to have economic growth (and therefore development). For example education and training in Brazil will increase the productivity (productivity is defined as average production) of labour. Economic Growth can be defined either as an increase in the production of goods and services (increase in real GDP) or an increase in the production potential of the Economy. The diagram on the left shows one way to illustrate actual economic growth. 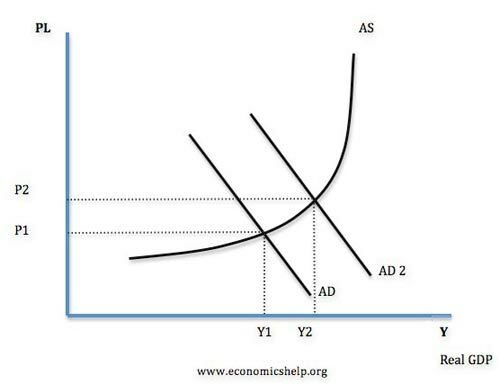 Equilibrium is first at Y1 and a change in one or more of the components of Aggregate Demand shifts AD to AD2 and the new equilibrium is at Y2. Because Y2 is larger than Y1 there has been economic growth. Note the economy has moved closer to Full Employment (not shownbut you know where that is). 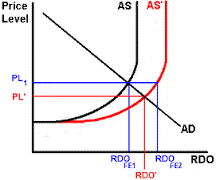 The potential output of the economy is given by the LRAS curve since it shows full employment output (real GDP). Remember what actually happens is given by equilibrium changes.